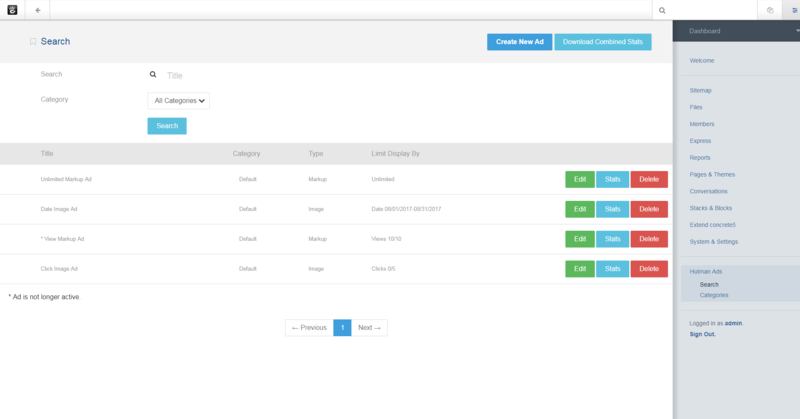 Hutman Ads is an add-on for managing custom website ads. You get a dashboard page that allows you to add, edit or delete any ads site wide as well as view statistics on ad clicks and views. Ad Statistics are available on a per-ad basis or combined. If a single ad is selected a table and graph of ad statistics are displayed on the page for review as well as an export to CSV option. If exporting combined stats a CSV will be exported with all data for the selected date range, broken down by month. The Human Ad Display block allows you to display a select number of random ads and optionally restrict display to only one category. The ad’s “Limit Display By” can be set to Date and a Start and End date will be required, the ad will only display during that time period. If it is set to Clicks the ad will display until it has been clicked the designated number of times, after that it will no longer display on the site. If it is set to Views the ad will display until it has been viewed the designated number of times, after that it will no longer display on the site.